An interdisciplinary conversation between law and Christian thought exists, but has so far been centered in the legal academy. Law scholars have fruitfully critiqued contemporary legal and jurisprudential issues by drawing upon concepts and norms from the field of religious ethics. However, the conversation needs to move in the opposite direction as well-centered in religious studies and theology and reaching out to the legal field. 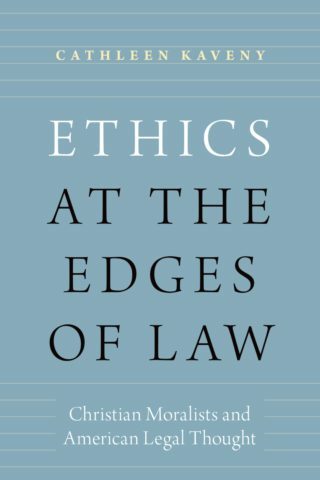 Ethics at the Edges of Law begins this movement by arguing for the discipline of law as a valuable source of moral wisdom and conceptual insight for ethicists. Cathleen Kaveny shows how the work of important contemporary figures in Christian ethics, including John Noonan, Stanley Hauerwas, and Margaret Farley, can be enriched and illuminated by engagement with particular aspects of the American legal tradition. The book is divided into three parts: Part I, “Narratives and Norms,” examines how the legal tradition can shed light on the development of religious and moral traditions. Part II, “Love, Justice, and Law,” uses particular legal cases to advance questions about the relationship of love and justice in Christian ethics. Part III, “Legal Categories and Theological Problems,” shows how legal concepts can reframe and even resolve moral controversies within religious communities. With this book, Kaveny leads the way towards a mutually profitable exchange between the American legal tradition and the tradition of Christian ethics.